I just found a new thing to play with, 3D Electronics Design. I have seen some great 3D images of electronics component design for sometimes but I couldn't figure how they were made. Below image is one of my favorite. Please see http://www.blueroomelectronics.com/ for more images. I have been playing with Eagle3D for sometimes. However, I cannot manipulate my design interactively and cannot export models to render in other 3D renderers. 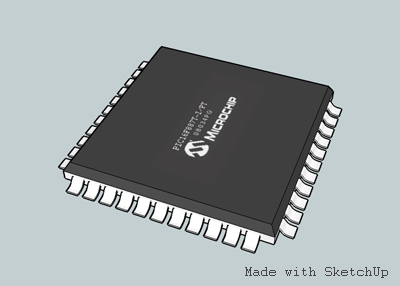 Just today, I found that blueroomelectronics's designs were made with Google SketchUp. So, I downloaded and installed it. The software is very easy to use. But, there is no electronics component library. However, there are some components available for you to download from google 3D warehouse. If you want anything that not available in the google 3D warehouse, you have to make it by yourself. Below is my first try on making a PIC16F887 with TQFP-44 package. I hope that I will come up with complete 3D designs of my clock projects. It's very fun to do these things.